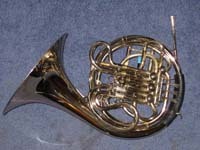 Bill Karstens studied horn with James Chambers at the Juilliard School in NYC, and played in many orchestras in the NYC area including Broadway shows and the NY Philharmonic. He later joined the Montreal Symphony Orchestra, founded the Canadian Brass Quintet, played in CBC radio and TV orchestras, and did commercial work and recordings. Bill taught privately and at McGill University and the University of Vermont. 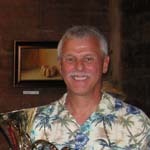 Many of his former students have become professional musicians in orchestras throughout the U.S., Canada, and Europe. 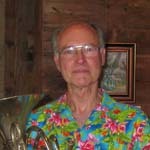 Bruce McRae teaches grade 4 - 12 instrumental music at Bellows Free Academy in Fairfax, Vermont. He plays both trumpet and horn (but not simultaneously), and is a retired member of the Vermont National Guard and a licensed pilot. Helen Read is a Senior Lecturer in Mathematics at the University of Vermont. She grew up on math and science, complemented by an equally intense interest in music that has developed into a lifelong avocation. 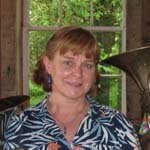 In addition to Vermont Horns, Helen is a member of the Amateur Musicians Orchestra, the Green Mountain Mahler Festival, the Citizens Concert Band, and the Milton Community Band, and has played in pit orchestras for numerous local theater productions. Helen also enjoys ice skating, hiking Vermont's Green Mountains, and helping family and friends with their computers. 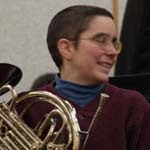 Marti Walker has been playing horn since 5th grade, although she didn't actually have a clue what was going on with that person up front waving a little white stick until 9th grade. Bands and orchestras and pit-performances and small ensembles ever since. She seriously considered studying to turn pro, but the ADHD is too strong and the distractions too fun. When not honking horn, Marti muddles with ski patrolling, mountain biking, sailing, hiking, and learning a second career as a physician assistant. She's a continual source of amusement and exasperation to her nearest and dearest ... remember the ADHD? "When all the players synch in tune and time ...transcendence occurs. I, the other players, the instruments, the space and its contents cease to be, and only the music 'is'."